Taylor, John. "Ottawa". The Canadian Encyclopedia, 11 March 2019, Historica Canada. https://www.thecanadianencyclopedia.ca/en/article/ottawa-ont. Accessed 20 April 2019. Ottawa, Ontario, incorporated as a city in 1855, population 934,243 (2016 c), 883,391 (2011 c). The City of Ottawa is the capital of Canada and is located on the Ottawa River on Ontario's eastern boundary with Québec, about 200 km west of Montréal. The name "Ottawa" is thought to derive from an Algonquian-speaking First Nation of the same name, probably from a word meaning "to trade" (see Odawa). Amalgamation, on 1 January 2001, merged "old" Ottawa with 11 area municipalities and the Regional Municipality of Ottawa-Carleton to create a “new” city. The amalgamated city encompasses the municipalities of Ottawa, Vanier, Nepean, Kanata, Gloucester and Cumberland; the townships of Rideau, West Carleton, Goulbourn and Osgoode; and the village of Rockcliffe Park. Despite being named for the Odawa First Nation, Ottawa is located in the traditional territory of the Algonquin	people, a group closely related to both the Odawa and the Ojibwa. 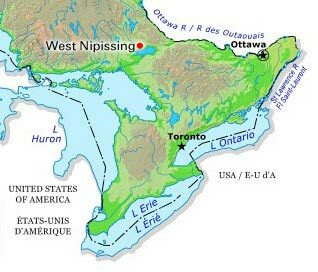 The traditional territory of the Odawa people was west of the Ottawa Valley along the shores of Lake Huron; however, they traversed the river to engage in the fur trade. Until about 8,000 BCE, the Ottawa Valley was covered by the Champlain Sea which formed after the retreat of the continental glacier around 11,000 BCE. The earliest evidence of human habitation in the region dates to 6,500 BCE. The Algonquin relied on hunting moose and deer, trapping beavers, fishing and, to a lesser extent, agriculture for survival. The Ottawa River, which the Algonquin called Kichi Sibi,meaning “Great River,” and its tributaries were a conduit for trade networks between Indigenous peoples which archaeological evidence suggests stretched as far as the northern tip of Labrador in the east and Lake Superior	in the west. In 1608, Etienne Brûlé was the first European to explore the Ottawa River. Samuel de Champlain	followed him in 1613. During his voyage, Champlain took part in an Algonquin ceremony at Chaudières Falls, located in present-day Ottawa. From the 17th to 19th centuries, the Ottawa River served as the chief artery of the Montréal fur trade as well as further exploration into the interior of the continent. The arrival of European explorers and traders introduced diseases such as smallpox, which devastated the Indigenous populations (See Epidemic). The advent of the fur trade also drew the Algonquin into increasing conflict with the Five Nations Iroquois for control over resources and trade routes (See Haudenosaunee). By about 1650, weakened by disease and warfare, the Algonquin lost their control over the Ottawa River. By the end of the 18th century, European settlement in the area was limited to a few minor fur outposts. In 1800, New Englander Philemon Wright established the first permanent settlement, an agricultural community at the site of Hull, Québec (then Lower Canada). Itinerant lumberers were drawn by the trade in squared timber begun in 1806 by Wright. On the Upper Canadian side of the river, agricultural settlers began moving in shortly after, beginning with Ira Honeywell in the winter of 1809–10 in Nepean Township and Braddish Billings in 1812 in Gloucester Township. The largest group to arrive was the dozen families of British soldiers who settled at Richmond in 1818. Like the Wrights, many of these early settlers combined farming with lumbering, whether harvesting and sometimes milling logs, or supplying food for the growing trade in squared timber. Ottawa itself grew from an unnamed campsite established in 1826 by Royal Engineers under Lieutenant-Colonel John By as a construction base for the Rideau Canal. It was situated on a 30 m bluff flanking the headlocks, near Chaudière Falls and the mouths of the Rideau and Gatineau rivers. It immediately attracted contractors, labourers and a small community of merchants, tradesmen and professionals. By 1827, a considerable town named Bytown had sprung up. In the 1830s the timber trade to Britain became the focus of economic activity in the region. Bytown became a provisioning centre for timber workers and soon eclipsed "Wrightsville" (later Hull) as the principal valley town. A new industry emerged in the 1850s when the power of Chaudière and Rideau falls was employed to saw logs into lumber for the American market. In 1855, Bytown's name was changed to Ottawa following its incorporation as a city, sought in part to shake free of the oversight of Carleton County. By the 1860s, in addition to a large trade in squared timber, Ottawa contained one of the largest milling operations in the world, accompanied by huge cutting, driving and barging operations, and was connected to the Grand Trunk Railway	and American rail networks. The railway made Ottawa a serious candidate for permanent capital of the Province of Canada, but urban rivalries made any choice politically dangerous and the matter was thrust upon Queen Victoria. Colonial officials ensured that her choice would be Ottawa, which was announced on the last day of 1857. Being named the capital spurred Ottawa’s growth. Between 1851 and 1871, the city’s population nearly tripled from 7,760 to 21, 545. The erection of government buildings and homes for the newly arrived civil servants also initiated a construction boom. Construction of the Parliament buildings began in 1859, and they were officially opened in 1866. In 1867, the city was made capital of the new Dominion of Canada. Around 1890, the hydroelectric potential of Ottawa's rivers began to be exploited. The chief industrial application of this hydroelectric power	was in the production of pulp and paper using the inferior logs from the depleting valley forests. The sawn lumber industry declined significantly in the 20th century. By 1940, owing to the creation of a massive federal bureaucracy to prosecute the war effort, the federal government emerged as the dominant employer, offsetting the decline of the lumber industry. The National Research Council	and Defence Research Board, along with the two area universities, provided the foundation for the growth of a high-tech sector in the second half of the 20th century. This sector emerged in 1961 with the establishment of Computing Devices, later Leigh Instruments, developers of the precursor to aviation's black box. Of critical importance was the decision of Bell Northern Research (which became Nortel) to place its operations in Ottawa. Its labs also opened in 1961. The addition of further companies such as Corel and JDS Uniphase in the 1980s and afterwards helped earn Ottawa the moniker “Silicon Valley North.” Despite struggles at the start of the 21st century, exemplified by Nortel filing for bankruptcy in 2009, the high-tech sector continues to play a dominant role in the city’s economy, expanding into burgeoning fields such as clean technology. Skaters on the Rideau Canal in Ottawa. 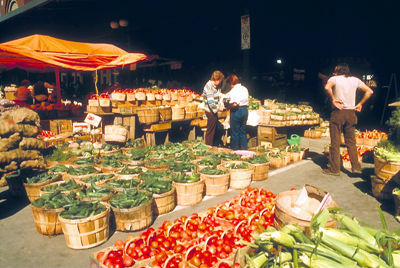 One of Canada's oldest and most popular urban markets (Corel Professional Photos). With the Parliament Buildings in the foreground (Corel Professional Photos). The National Capital Commission (NCC), created in 1959, is a Crown Corporation dedicated to the beautification of the city. It has removed rail lines and yards from the city core and preserved the scenic canal. The NCC maintains the extensive system of driveways in the city lined with millions of tulip bulbs and other flowering plants; it operates a number of parks and in winter maintains the world's longest skating rink (7.8 km) on the frozen Rideau Canal. In 2013, however, the Harper Conservative government reduced the organization’s budget and has since also transferred its role as promoter of the city and events to Department of Canadian Heritage. Ottawa is an urban centre surrounded by breathtaking natural beauty. Rapids and waterfalls punctuate river courses, which are protected by parks and driveways. In the 19th century, the city developed around “Lower Town,” east of the Canal, including the “Mile of History” along Sussex Drive and the Byward Market. With the growth of the government economy in the 1860s, “Upper Town” emerged as the centre for retail and offices in the city. The Central Experimental Farm (established in 1886) serves as a research facility for the Department of Agriculture (now Agriculture and Agri-Food Canada), located on the southwest fringes of the city on 400 hectares (ha) of land. The farm, along with a federal "greenbelt" girding the built-up region, are treasured amenities. The area located in the core has been appropriated and redeveloped with parks (Confederation Square) or major national buildings (National Arts Centre, National Defence Building and Bank of Canada Building) by the federal authority since the 1920s. One of the most notable sites in the downtown core is the Rideau Centre, which was conceived to revive the declining consumer retail market in the 1960s and 1970s. Opened in 1983, the Rideau Centre is a convention, hotel and shopping complex, and serves as a transportation hub. The amalgamated City of Ottawa includes suburban regions including Nepean, Kanata, Gloucester, Rockcliffe Park, Vanier and Cumberland. Many of these areas were developed in the 1970s outside the greenbelt and in close relationship with the high-tech industry. Carleton University (founded in 1942) is located outside the downtown core, between the Ottawa River	and Rideau Canal. The University of Ottawa was founded by the Oblate Fathers as the College of Bytown in 1848. It became a provincially-funded institution in 1965. 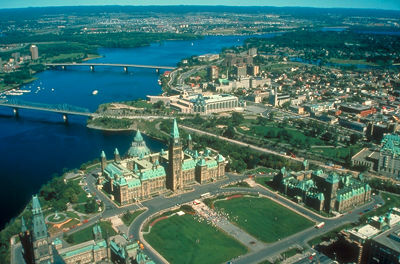 The university is the world’s largest bilingual university and located steps away from Parliament in the downtown core. St. Paul's University, run by the Oblate Order, is affiliated with the University of Ottawa. Through Algonquin College and its French counterpart, La Cité Collégiale, Ottawa is also the centre of the region's community college system. For more than a century after its initial settlement, Ottawa’s population was roughly one-quarter French Roman Catholic and one-quarter Irish Roman Catholic, with most of the remainder being Protestant of British origin. Traditionally, the Protestant and English community favoured the Upper Town of the core area and the western and southern parts of Carleton County, while the Roman Catholic and French community tended to reside in the Lower Town of the core and the eastern parts of the county. Religious institutions (churches, schools and hospitals), ethnic associations and even political organizations solidified this pattern. Nineteenth-century Ottawa was a focal point of Catholic and Protestant-Orange militants, and also emerged as the capital of Franco-Ontario and the centre of early Canadian conflicts over language. Protests against Regulation 17, passed by the Ontario government in 1912, banning French-language instruction after the second year of schooling, were strongest in Ottawa. After the Ottawa Separate School Board refused to implement the regulation, the provincial government replaced it with an appointed board, a move that was later ruled unconstitutional. Small communities of other European immigrants, chiefly Jewish, German and Italian, began coming to Ottawa around the turn of the 20th century. Since the end of the Second World War, the city has also seen an influx of immigrants from Asia, Africa, the Middle East and the Caribbean. According to the 2016 census, people citing Canadian origins make up the largest ethnic group, at 28.5 per cent of the city’s population, followed by Irish (21.7 per cent) and English (21.1 per cent). Visible minorities account for 26.3 per cent of city residents, with Black, Arab, Chinese and South Asian people comprising the largest communities within this group. As the nation’s capital, Ottawa is officially a bilingual city; however, the majority of residents (64.1 per cent) cite English as their mother tongue. Native French speakers account for 15.8 per cent of the city’s population, while 37.6 per cent claims at least some level of English-French bilingualism. Ottawa’s original settlers were primarily employed providing services for workers in canal construction, the squared timber trade and agriculture. By 1861, industrial jobs, most associated with sawmilling, comprised about 48 per cent of the labour force. Government employment, which accounted for only 10 per cent of the labour force in 1871, grew to about one-third by 1971, including large numbers of women, while manufacturing fell to about 6 per cent. Today, the largest number of Ottawa residents are employed in public administration followed by health care and social assistance, professional, scientific and technical services, and retail. Rivers and canals formed the city's original transportation corridors and were the basis of its claim as the economic capital of central Canada: the Rideau Canal to Kingston; the Gatineau River into the Québec Laurentians; and the Ottawa River east to Montréal and west to Lake Huron. Today, transportation is now largely by road and rail; the city is on both transcontinental rail lines and on the Trans-Canada Highway. Flights to Ottawa fly into the Macdonald-Cartier International Airport, which was opened by Prime Minister John Diefenbaker on 30 June 1960. On 24 August 1964, the airport was designated the Ottawa International Airport. To honour two fathers of Confederation, the airport was renamed after John A. MacDonald	and Sir George-Étienne Cartier in June 1993. Ottawa has one of Canada's busiest air terminals, largely owing to its location on the Montréal-Toronto-Ottawa air triangle. Public transportation is provided by quasi-autonomous OC Transpo, which is municipally controlled. Cyclists can explore and commute in Ottawa on over 600 km of bike paths and trails. Since 1984, Citizens for Safe Cycling, a local grassroots non-profit organization, has helped establish a safer and accessible network of bike lanes, paths and trails for the city’s commuters. 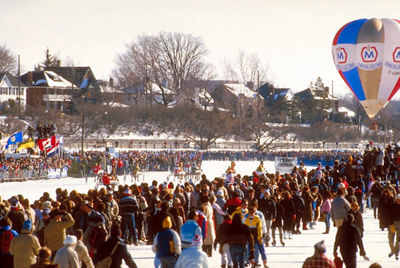 In the winter, residents also have the option to avoid traffic and commute to work or school by skating the Rideau Canal. The Canadian Public Affairs Channel (bilingual) is a national network based in Ottawa focusing on the federal government’s daily activities. In addition, both the Aboriginal Peoples Television Network and the Inuit Broadcasting Corporation have bureaus in Ottawa. There are independent radio stations run by students at the two area universities and Algonquin College. Ottawa's daily newspapers are Le Droit (French), The Ottawa Sun (English) and The Ottawa Citizen (English). The Ottawa Citizen has undergone several changes in ownership. Originally, the Southham family owned the paper until 1996 when it was acquired by Conrad Black’s Hollinger Inc. In 2000, Black liquidated much of his media empire to CanWest Global. Specialty newspapers include The Hill Times, a weekly newspaper concentrating on Canada’s politics and news on Parliament, and Xpress, a free critical arts publication. National Capital Freenet (NCF), established by individuals at Carleton University in 1992, is one of the original and still operating “freenet” sites in Canada. The “freenet” platform, unlike commercial internet providers, is owned by its members and since it is based in Canada, data is protected by Canadian privacy laws. NCF was one of Ottawa’s first Internet providers and continues to offer both dial-up and high-speed services at affordable prices. The university is also the site for Schoolnet, originally a site for material generated by the Canadian government. It now supplies an array of educational material to, and provides a communications link for, schools across Canada. From the outset, Ottawa had a ward system sensitive to internal linguistic and religious divisions. Administration was a council-committee system until 1908, when a council-board of control system (the mayor and four controllers elected at large) was adopted. The Ottawa Board of Control was created to mimic a “city commission system,” and considered at the time as a mark of progressive and efficient organization. In practice, however, this organization excluded the minority of French Catholics in the city and certainly concentrated power at the municipal level in the hands of a select few. In 1978, Mayor Marion Dewar abolished the Board of Control, adopting a system whereby power was distributed to all who sat on Ottawa City Council. In 1969, a regional authority was put in place to plan and provide services for these municipalities. As of 1 January 2001, a single authority made up of a mayor (elected at large) and 23 councillors (elected by ward) administers the city on a council-committee basis. Each member of city council serves four year terms. At the provincial and national political level, since 1841 Ottawa's Irish-French Catholic communities have mainly voted reform or Liberal, and the Anglo-Protestant communities Conservative. An NDP presence and shifting social patterns have recently altered this tendency, especially in the suburban areas that contain much of the population. The federal government, though the city's largest landowner, is constitutionally exempt from city bylaws and taxes, and the extent of its responsibility to respect laws and provide grants in lieu of taxes has for more than 100 years been a chronic, controversial and unresolved issue between the Crown and the city. In 2001, amalgamation brought 11 municipalities and the regional government, which was established in 1969, under the authority of the single city of Ottawa. Still, a provincial boundary divides the metropolitan area, which is about two-thirds in Ontario and one-third in Québec, where two regional governments, the Communauté urbain de l'Outaouais, the Municipalité regionale de comté des collines de l'Outaouais and a number of municipalities, including the cities of Gatineau, Hull and Aylmer, operate. On 1 January 2002 the Québec government merged the Outaouais municipalities into the single city of Gatineau. 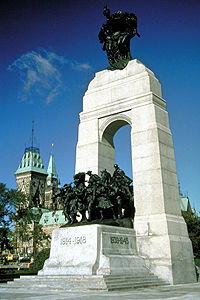 National War Memorial, Ottawa - Confederation Square. At 9:52 a.m. on 22 October 2014, a gunman opened fire and killed Corporal Nathan Cirillo, a member of the Hamilton-based Argyll and Sutherland Highlanders (Princess Louise’s), who was standing guard at the National War Memorial. The gunman then proceeded to Parliament where he engaged in a gunfight with the RCMP and was shot dead by Sergeant-at-Arms Kevin Vickers. 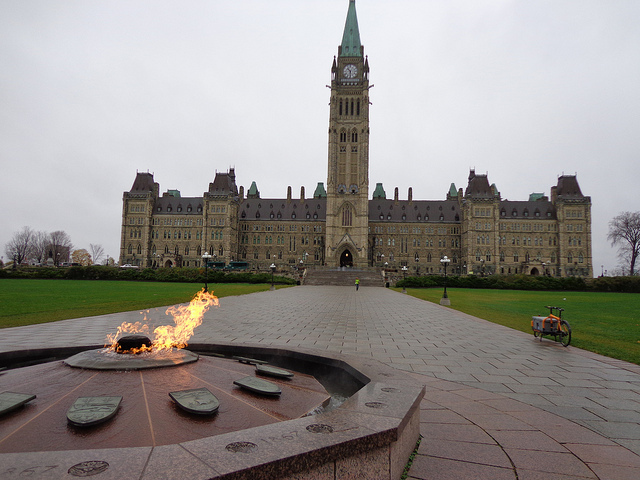 Centennial Flame on Parliament Hill in Ottawa. The Supreme Court of Canada building in Ottawa. Rideau Hall is, since 1867, the official residence in Ottawa of both the Canadian monarch and the Governor General of Canada. Ottawa is a city that was built up around heritage buildings, historic sites and landmarks. The Parliament of Canada, for example, serves at the heart of this country’s democratic government but is also a popular attraction for visitors. Tourists can marvel at the High Victorian Gothic –style architecture of the building, which overlooks the mighty Ottawa River, from the expansive lawns. Visitors can also ascend the Peace Tower and view the Commons and Senate chambers in the Centre Block on free guided tours year round. Parliament Hill is the centre for Canada Day celebrations (1 July) as well as a number of sound and light shows projected on the façade of the building. Only steps away from Parliament are other popular landmarks including the Supreme Court of Canada, the Royal Canadian Mint, National Gallery and the National War Memorial. 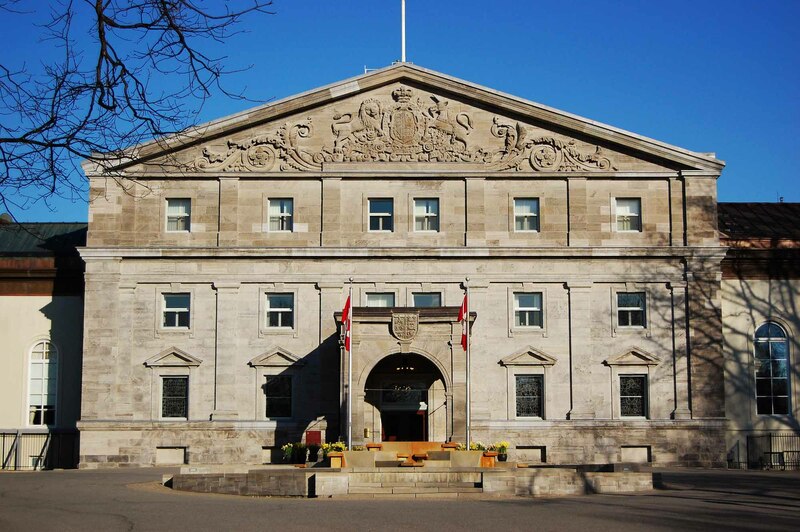 Rideau Hall, built in 1839, serves as the Governor General’s home and is also open to the public. This site features heritage gardens, in which foreign dignitaries plant trees to mark their visit, and an outdoor skating rink in the winter. Canadian War Museum in Ottawa. Photo taken on: 30 July 2011. The headquarters of Library and Archives Canada on Wellington Street in Ottawa, Canada. The federal government maintains many of the city’s cultural institutions and its facilities, including the National Museums , the National Gallery, The National Arts Centre and Library and Archives Canada. 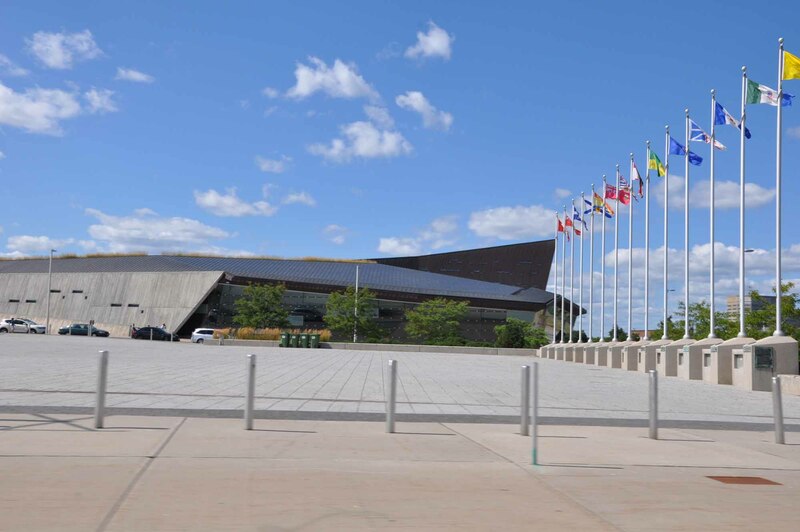 The three largest cultural institutions located in and near the downtown core include the Canadian Museum of History (established in 1856), the National Gallery of Canada, and the Canadian War Museum. The Museum of History is noted for the largest collection of totem poles in the world. In 2017, the museum will open its Canadian History Hall. The War Museum, the newest federal museum opened in 2005, is a sombre and architecturally striking monument to the history and experience of war in Canada’s history. On the arts front, Ottawa boasts two theatres, Nepean's Centrepointe Theatre and the Cumberland Town Hall Theatre. Before these major additions, the only space owned by the old city was a small "black box" in downtown Arts Court, a multi-purpose facility converted from the old County Court House. Arts Court also contains the Ottawa Art Gallery and is home to numerous arts groups, including Canada's pre-eminent contemporary dance group, Le Groupe Dance Lab (see Le Group de la Place Royale). 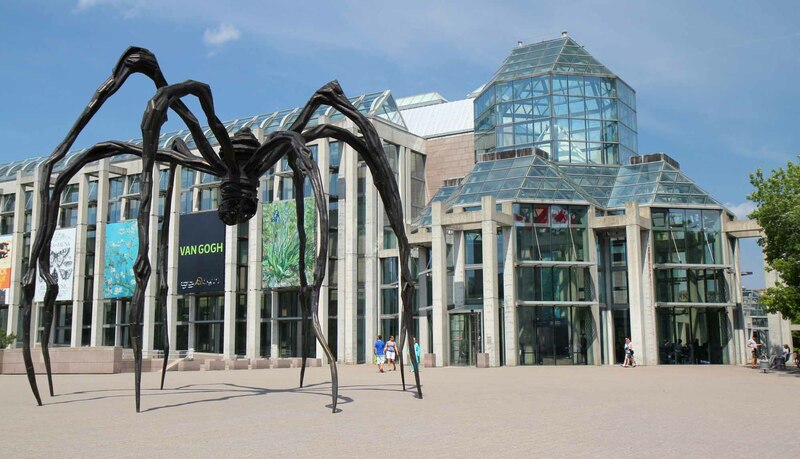 In addition to the Ottawa Art Gallery, the new city has galleries in Nepean and Kanata, and the Karsh-Masson Gallery at old Ottawa City Hall. The small, prestigious gallery at Carleton University complements these galleries. The new city also supports the Great Canadian Theatre Company, a professional company and facility; Ron Maslin Playhouse, home to Kanata Theatre; and La Nouvelle Scène, home to four resident French theatre companies. Ottawa's oldest facility and company, Ottawa Little Theatre, is a fully volunteer-run non-profit organization. The NAC is home to the NAC orchestra as well as the Ottawa Symphony Orchestra and serves as a venue for travelling companies. Opera Lyra, operating from Arts Court, is the city's professional opera organization and also performs at the NAC. Orpheus, its musical theatre organization, operates out of Centrepointe. The city also contains numerous instrumental groups, like the Thirteen Strings, and choral outfits, like the Ottawa Choral Society. They are complemented by a concert hall and extensive music program at the University of Ottawa. Music also reaches large audiences through locally produced music festivals, including Chamberfest Ottawa, the largest chamber music event in North America, and those featuring blues, jazz and folk music, as well as music that is annually part of Le Festival Franco-Ontarien. 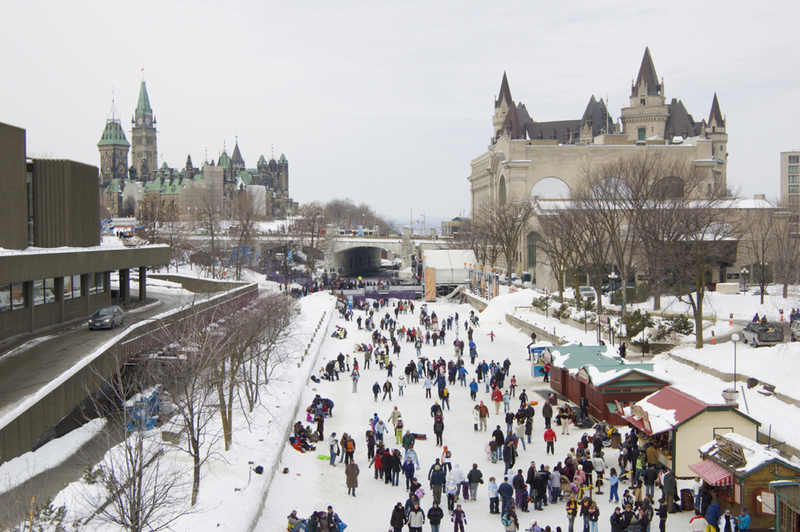 In winter the National Capital Commission maintains the longest skating rink in the world, along the Rideau Canal. The Chateau Laurier is in the background (Corel Professional Photos). Ottawa is the site for the biennial Canada Dance Festival and the Ottawa International Animation Festival, the largest event of its kind in North America. 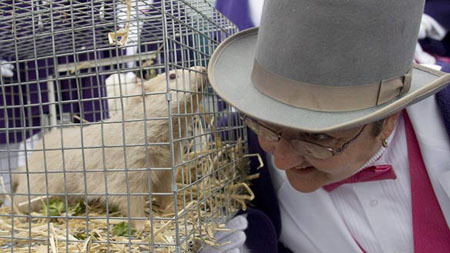 Other annual local festivals include the Children's Festival, as well as the Tulip Festival and Winterlude. In 2001, Ottawa and Hull sponsored the Francophone Games, an international event featuring both athletics and culture. Well-known writers who call Ottawa home include John Metcalf, Charlotte Gray, Giller Prize nominees Elizabeth Hay and Alan Cumyn, and Governor-General's Prize nominee Brian McKillop. The city is also home to Canada's national poetry magazine, Arc, and a number of independent publishing houses, the largest being Oberon Press, and two presses in French. There is a long tradition of filmmaking in Ottawa through Crawley Films, the National Film Board of Canada and the Ottawa International Animation Film Festival. Film and video artists who work in the city can develop their craft with the Independent Film Makers Co-operatives of Ottawa (created in 1991) or the SAW Video Media Art Centre (created in 1981). Ottawa is home to the National Hockey League Ottawa Senators as well as the Ottawa '67s, a Junior-A hockey team. The Ottawa Senators operate out of the Canadian Tire Centre, in the suburb of Kanata. In 1996 the Ottawa Rough Riders football club ceased operations though, in the 2014 season, the city welcomed the return of football with their new team, the Ottawa Redblacks. Starting in 2015, Ottawa will re-join the CanAm baseball league with a double-A team called the Ottawa Champions after previous unsuccessful ventures. Bruce Elliot, The City Beyond: A History of Nepean, Birthplace of Canada's Capital, 1792-1990 (1991); David B. Knight, Choosing Canada's Capital: Conflict Resolution in a Parliamentary System (1991); John H. Taylor, Ottawa: An Illustrated History (1986); Carolyn A. Young, The Glory of Ottawa: Canada's First Parliament Buildings (1995). OttawaThe official website for the City of Ottawa. Features an extensive directory of local tourist attractions and events. Parliament HillA panoramic view of Parliament Hill in Ottawa. From Google Maps.